Trying this fabulous flaxseed gel recipe could be the answer to your gel woes. I would like to sing my praises for flaxseed gel as so many others in the natural hair care community choir have. Flaxseed gel is a wonderful and simple DIY for those of you who either want to save money or to use more natural ingredients on your hair. Having trouble finding a gel that’s too harsh or too wimpy, then try combining Flaxseed gel with other commercial gels to either soften or to give them more hold. It’s all up to you. That’s the beauty of a DIY. You customize it to suit your own hair needs. Gels have come a long way since the black sticky goo. Now there are tons of lighter gels on the market with ingredients that are more natural hair friendly. 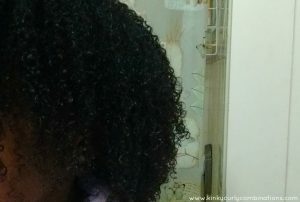 When I started wearing wash and go’s a little over two years ago I tried a very popular gel that gives really good hold. As I’ve noticed many times with my hair, just because a product is great for most people doesn’t mean it’s great for me. After using it for a few weeks I realized it was very hard to wash out of my hair and the protein in the gel was drying out the protein sensitive section of my hair. In my excitement to have 4 and 5 day wash and go’s I didn’t even notice that I was losing hair due to the protein overload. I started to search for other more gentle gels out there on the market. I tried about five to six different -mostly economical- gels that were either too sticky, too foamy, or provided so little hold that it just wasn’t worth the effort. 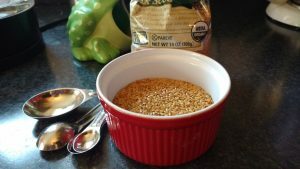 I had made flaxseed gel previously during my first year of being natural. I got the recipe from a Youtuber who was probably the first to put the recipe out there. This basic recipe was very simple: Combine 1/4 cup of flaxseeds with two cups of water and bring to a boil. At the time I didn’t even know what I would need to use flaxseed gel for. I thought maybe I could use it on my twist. That was as much as I knew. Unfortunately the gel didn’t work for me at that time. I believe it was a combination of things that caused my first flaxseed gel trial to not work: 1. My flaxseeds were not fresh. (I had them in the cupboard for a loooong time.) 2. My hair was so dry that it wasn’t able to hold onto moisture and 3. I didn’t even know to apply the gel to wet hair at that time. What a big mess! I finally decided to give flaxseed gel another try. By this time I knew to apply the gel to clean wet hair. It went on very easily, but I did not get the hold that I had with the previous gel. Fortunately, in my ongoing quest for all things DIY I came across more natural ingredients to add and gave it a go. I had to tweak the amounts to get the best results for my hair, but this is it below. 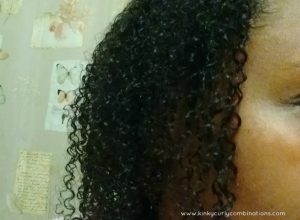 This recipe gave me plenty of hold while keeping the moisture in my hair. No gel that I have ever tried holds moisture in my hair better than flaxseed gel. And it’s so cheap to make! The last time I made this recipe I left out the cinnamon because I have noticed my hair getting a little lighter in color. Make sure to keep it in the fridge or freezer. Thanks to Rachelcpr on Youtube for these ingredients and the original recipe.